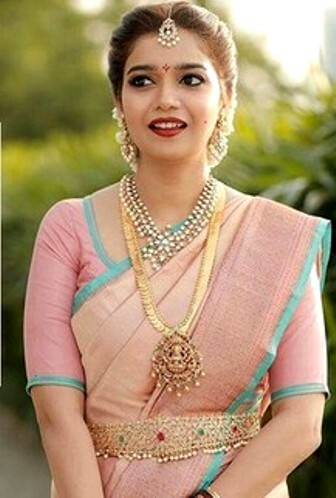 Women in India wear different types of jewelry to enhance their look. In fact, they believe that choosing right jewelry can enhance their looks in a great way. Women in India generally choose platinum jewelry to wear with western outfits. While gold jewelry suits any kind of outfits like saris, salwar suits, frocks and etc. Gold and platinum jewelry with diamonds, rubies and emeralds really looks great. You will definitely fall in love with that diamond and other precious stone jewelry available online. In India the jewelry trends generally differ from one state to the other. In fact, women in different parts of India wear different types of jewelry depending on their culture and availability of precious stones and metals. Here is a list of some jewelry which every woman should try. You will definitely look like a princess in the below mentioned jewelry. · Chandbali: Chandbali earrings look very elegant and they are popular in India since 19th century. Hyderabad nizams especially love the chandbali earrings. These chandbali earrings generally come with rubies, pearls and diamonds. You can try them for any kind of occasion with any type of outfit like anarkali suits, sarees and etc. · Sarpech: Sarpech is popular in India since olden days. Besides, this head ornament looks really great on women. · Maatha Patti: Most of the brides choose Maatha Patti for their wedding to look very grand and beautiful. · Jhumkas: These Jhumkas come in different styles with kundans, rubies, emeralds, diamonds and other precious stones. Besides, these jhumkas come in different metals like silver and gold. Check the Meenakumari jhumkas online and you will definitely love them. You can try these jhumkas with different outfits like saris, salwar suits and etc. They are a perfect choice for you if you are looking for earrings which look traditional as well as trendy. · Maang Tika: This jewelry piece is extremely popular among the Hindu women. You can try this Maand tika with ethnic wear to turn your looks outstanding. · Bajuband: Bajuband is also generally worn by the brides. This jewelry piece looks like a band and adds a great beauty to women. These Bajuband’s are generally available in gold metal. Do try them on your wedding day to look great. · Kamarband: This kamarband also looks great on women. This khamarband looks great with both lehengas as well saris. This khamarband is especially famous in South India. Khamarband with diamonds looks extremely great on women. · Kada: These kadas generally look like bangles. They look very thick and heavier in general. These kadas come with diamonds, enamel work and etc and suits any type of outfit. · Payal: Most of the women love to wear payal. Besides, you can find payals with kundans, uncut diamonds and etc in online at a very attractive price. They are available in different metals like gold and silver. · Pendants: You can find pendants in different designs and metals in online. You can wear these pendants with casual wear as well to look good. The gold pendant designs available online look very unique. Besides, you can try these gold pendants with any type of outfit. Check which stores online are famous for designer pendants and go through their customer reviews. You will definitely love the pendant designs available online. Gold pendants for women are available at a very affordable price on the online stores. Buy your favourite jewelry from online jewellery store now to look great this festival season!